History is made and celebrated accordingly as the citizens of London, the capital of the British Empire, elected a Pakistani Muslim as Mayor. It was a triumph over the forces of Islamophobia and, for many, another step towards ultimate Islamic rule over the world. However, for others the blatant hypocrisy of such celebrations were too obvious to ignore. We celebrate the acceptance of a religious minority in England while hatred against religious minorities reaches a fever pitch here. The truth is that election of Sadiq Khan raises questions that deserve to be given due reflection and not just emotional reactions. First let use clear up some important points. Number one: Sadiq Khan is not Pakistani. His parents immigrated to Pakistan during partition, but left before he was born in 1970. He was born in London. He is an Englishman of Pakistani heritage, but let’s be honest please…he is an Englishman. 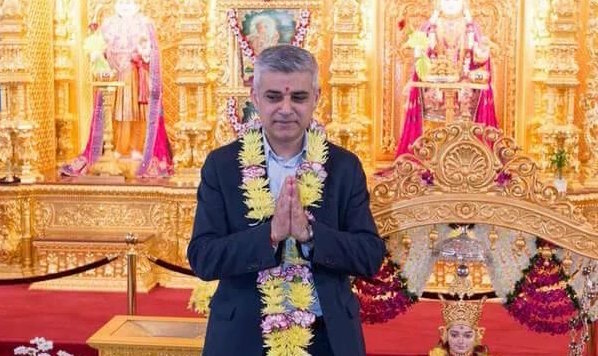 Number two: Sadiq Khan is secular. Much of the celebration of his election in Pakistan centres on his religion as he is personally a Muslim, but he just like he is not a Pakistani, also he is not a Muslim politician. He is a secular politician who just happens to be Muslim. As a politician, Sadiq Khan has supported gay rights and Jews. In 2013, he was declared wajib-ul-qatal and faced threats from jihadi extremists. He will be a Muslim Mayor of London, but he will not be Mayor of Muslim London. Number three: Sadiq Khan showed what the son of a bus driver can achieve…if he is not in Pakistan. The third thing we are told after we hear about this “Pakistani” “Muslim” is that he is the son of a bus driver. This is supposed to be the lesson that all of us can achieve greatness, but it is missing a key component. Does anyone honestly believe that the son of a bus driver will be CM Punjab? Son of a sabji wala will be PM? No. What we quietly ignore is that Sadiq Khan has achieved greatness because he lives in a secular democracy. This is the lesson of Sadiq Khan. You can be from humble beginnings, and you can be a devout Muslim, and you can achieve greatness under a secular democracy that rewards people for their hard work and tolerance of those who are different. If we want this for our children, we have the choice: Leave Pakistan…or change it. Imran Khan isn’t against America. He’s against the Jews who control America. Controversy erupted yesterday when BBC Urdu published an interview with US Ambassador Cameron Munter in which the American diplomat said that both Nawaz and Imran Khan had privately assured him that if they were brought to power they would lead pro-American governments. This obviously upset PTI supporters who began a full scale media campaign to prove that Imran Khan is not pro-American. Jahangir Tareen tweeted that “PTI is fiercely nationalistic” while the party’s Vice Dentist repeatedly denied that Munter ever mentioned Imran Khan (he did). Imran Khan sidestepped the question until a few hours ago when he told reporters that he was “misquoted”, explaining that PTI is neither “pro nor against the US”, but against American policies. This is a common explanation, but it’s also usually a cop out. In Imran Khan’s case, though, there is more to the story. Imran Khan is always very clear that he is not against the American people, only the policies of America’s government. Now, some say that you can’t separate the two completely because America is a democracy and the government is elected by the people. But Imran Khan knows that things are not that simple. America only looks like a democracy. In reality, though, it is secretly under the control of Israel. He explained this very clearly earlier this year. He explained this further while talking to Talat Hussain a few weeks ago. You see, it’s not America that Imran Khan is against. It’s the policies of the global Jew conspiracy against Pakistan’s and Iran’s nuclear programmes. So please, don’t put words in Imran Khan’s mouth. Just tell what he actually believes. There’s a war going on in Pakistan; in the mountains and in the cities. A war enforced upon the people of the country by monsters that we have created ourselves. The enemy in this respect is clearly visible and yet we want to continue treating it like an elusive ghost. Its targets are now obvious. But we dare not name them. But today, I will. These targets are those Pakistanis who have vigorously contributed in making Pakistan what it really used to be: a temperate, promising conglomerate of various ethnicities, religions and Muslim sects. The Sunni Barelvis, the Shias, the Christians, the Hindus and the Ahmadis – they are all under attack in their places of worship and shrines. They are being attacked in the most remorseless manner by a rare, violent breed of animals that uncannily look like human beings but are nothing like them. If – as mindless babblers like Imran Khan, Hamid Gul, Zaid Hamid, right-wing anchors,investigative journalists and other such media fodder for reactionary whiplash would suggest – these inhuman assaults take place due to the drone attacks, I want to ask, exactly how many handlers and planners of these drones were present in all the mosques, shrines and bazaars that have been attacked by these monsters? Just wait, one fine day you will also be able to see names like China and Iran on that sheet that is read and repeated ad nauseum. Yes sir, anything and anyone, but us. Shah Ghazi is known by Karachiites as the city’s patron saint. According to tradition he arrived from Iraq in the eighth century to preach the kind of tolerant, pluralistic and empathetic Islam that the region has known for centuries. His is the kind of faith that the so-called puritanical ogres scoff at and want to literally blow to pieces; a faith that the many otherwise ‘respectable-looking’ apologists of these monsters running amok on TV screens tell us is ‘wrong’ and ‘impure’. They tell us it’s all a diabolical conspiracy against our faith and country. A conspiracy by the wretched Hindus, scheming Jews and of Western countries that are ironically visited quite frequently by this vivacious gung-ho gang of armchair and TV studio politicians, journalists and ‘experts’. An implausible narrative is formed and gleefully peddled, as media men comment on the issue as if reading from a script of a bad James Bond movie, or a thrilling Ibn-i-Safi novel, in which fantastical plots are hatched by evil geniuses and dotty synchronistic connections made by the daring heroes. Karachi has been evading the curse of the kind of delusion that feeds these blood-thirsty ogres and their shameless, populist defenders. The evasion maybe coming to an end, but not if the three main political parties of the city and Sindh restrain from indulging in the kind of petty squabbles they’ve been indulging in lately. There is no doubt that it is the coalition of MQM, PPP and ANP that has kept Karachi saner and safer compared to the madness faced in this context by the people of Khyber Pakhtunkhwa and the Punjab. Sure, these parties have been a failure to reign in their respective anarchic renegades out on a targeted killing spree, but the consensus against psychotic extremists remains the strongest in Karachi and Sindh. MQM (perhaps the toughest bulwark in Karachi against violent religious fanatics), I am afraid will have to cut short its sudden admiration of Madam Aafia; PPP will have to stop negating its own tough talk against extremism by indulging in populist, empty sloganeering; and the ANP (that has suffered so much at the hands of the faithful psychos in Khyber Pakhtunkhwa) must stop ridiculing MQM’s concerns of the possibility of some Taliban gathering in disguise in the city’s Pashtun areas. The Pakistani people, politicians and army have all suffered deaths and great tragedies in this war. But despite so much carnage and terror, Pakistanis are still looking for contrived and utterly convoluted answers that are readily given to them by the media and the small, manic political parties. They are doing so because many of us are terrified of a simpler, to-the-point truth: these monsters are not only amidst us, but they are from among us! If this nation has braved through so much terror and madness, then why do we continue to hide in fear from this one vital truth. We must realise that without owning up to this truth, this country will never be able to rid itself from the blood-soaked quagmire it has gotten itself into. This article originally appeared on the Dawn Blog.